Want to save thousands and be debt free? Learn how with our free in-depth guide. It may feel like you will never be able to pay back all of your credit card debt. 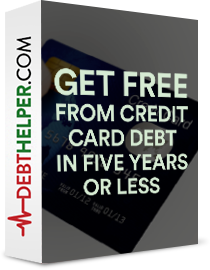 But with a little help from DebtHelper.com, it’s possible to pay off thousands of dollars in credit card debt in less than five years. Best of all, you’ll save (lot’s of) money, improve your credit score and protect your financial future. You’ll learn how in this free guide. How to find hidden savings by analyzing your credit card statements. How to implement simple techniques to save hundreds/month (really). How a Debt Management Plan can help get debt free in 5 years or less, and save thousands in the process. How a Certified Credit Counselor can help you create a budget to stay free from debt.